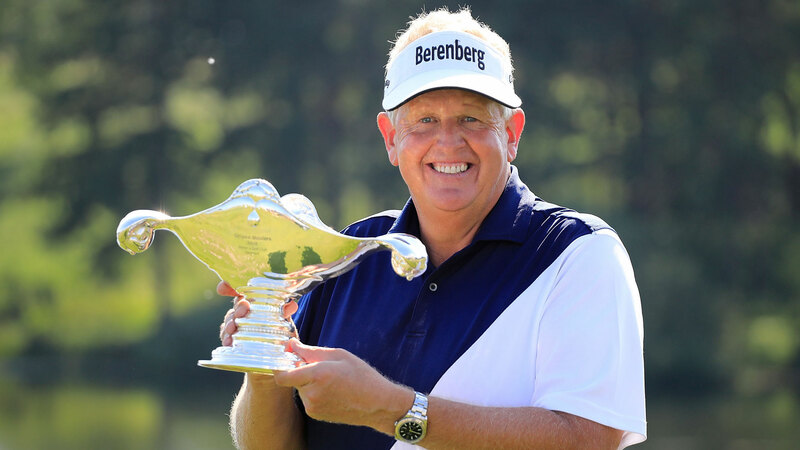 Colin Montgomerie claimed his ninth win on the Staysure Tour after a scintillating final round at the Shipco Masters promoted by Simon’s Golf Club. The Ryder Cup legend, who had not won on the Staysure Tour since 2015, came from four shots behind as he fired a five under par round of 67 to take victory at Simon’s Golf Club ahead of English duo Paul Eales and Barry Lane, who both finished on eight under par. Montgomerie’s 1993 Ryder Cup teammate and overnight leader Peter Baker carded a three over par round of 75, while the Scotsman seized the opportunity to add the inaugural Shipco Masters promoted by Simon’s Golf Club to his impressive CV, after he recorded an eagle and five birdies and dropped just two shots on his way to victory. A second round of 67 saw the 31-time European Tour winner move into prime striking position before his final round, and got off to a perfect start with a birdie on the first. The day turned in Montgomerie’s favour when he eagled the seventh hole with a two-foot putt to lead in Kvistgård. A dropped shot on the ninth hole brought him within reach of the chasing pack but three birdies on the final nine holes, including a final gain on the 17th, saw the Scottish star secure his first victory on European soil since the 2015 Travis Perkins Masters. “It feels superb, absolutely superb. It means as much as any of the wins on the European Tour or wherever it might be, this is superb, it really is,” he said. “There were 60 guys starting and you’ve ended up at the top of the pack – the self-esteem goes through the roof when you win. It has given me a lot of confidence to go forward now for the rest of the year. “I needed something in the mid-60s – I knew that. I played for a five at the last knowing I was three ahead. Anytime you score 67 it can’t be that bad, you can’t be playing on the Tour badly, so two 67s was good. I needed that after a disappointing first round 71. “I knew I had to get out of the blocks early. I had to put pressure on Peter Baker and Barry Lane – known winners. I had to put pressure on them early on and I managed to do that and then sustained it. Fellow victorious Ryder Cup Captain Paul McGinley and South Africa’s James Kingston carded final rounds of five under par to join Baker in a share of fourth place. 1991 Masters Champion Ian Woosnam recorded a blemish-free round of five under par to move to tied seventh. While Dame Laura Davies, who made history as she became the first female to compete in a Staysure Tour event, finished a commendable tied 44th. Montgomerie’s victory maintains his position in second place on the Staysure Tour Order of Merit after he moved to second last week with a tied sixth finish at the KitchenAid Senior PGA Championship.